Detail: 8 - typical ERTL soft details. Accuracy: 8 - missing windows on secondary hull. Instructions: 7 - paint guide is nicely done, but inaccurate in colors listed. Overall Rating: 9 - Worth the money, especially if you get one at ToysRUs for $5, like I did. The Excelsior was one of the most eagerly anticipated new kits a while back - and many folks were disappointed when it first came out since it is not in scale with the Enterprise-A kits. Still, it builds a decent looking model and is easy to assemble and paint. The Enterprise-B and her sister ships are upgraded variants of the earlier Excelsior-class ships. The two variants are externally distinguishable by the prominent ventral bulges and reworked impulse engine layout of the later variants. Likewise, the two AMT/ERTL kits are very similiar, and can be assembled, detailed and painted in the same steps. Both kits are on the small side and though they make nice enough display models, I didn't think they were really worth the effort of lighting. The kits appear accurate in size, shape, and details. I liked the detailed, over-sized painting/decal instructions - the markings are correct, though the colors are not (see below). You can build 'em straight from the box, but a little effort will greatly improve their appearance. The indentations on the horizontal part of the warp pylons are best painted before you glue the pieces together. Mask with liquid masking stuff before finishing the rest of painting and building. The deflector array looks goofy glued to the back of the 'tunnel' it sits in. 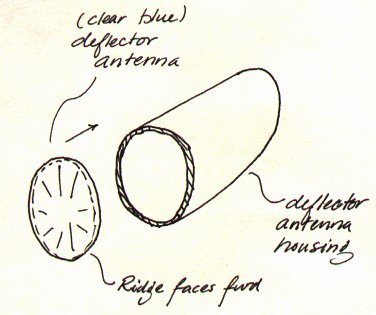 Cut out the back of this 'deflector antenna housing'(part #8) and glue the clear deflector dish in from the back. Testors Titanium Metalizer paint looks better than plain silver in the 'tunnel'. Use Tamiya Clear Blue and Smoke for the blue and dark grey portions of the warp engines and the deflector array (paint on the outside of the clear parts: ignore the instructions). Use Tamiya Clear Red for impulse engines. Mount these after everything else is done. After emplacing the center impulse "exhaust", mount a strip of .010 styrene, slightly wider than the clear part, across the top - to make it look like something other than a clear part painted red and tacked on the back of the saucer section. Decals 4 & 6 are reversed on the painting guide. Put 4 where it says six goes, etc. It's difficult to tell, but decals 16 & 17 go on the side of the "spine that runs across the top of the saucer section. They're easier to emplace if you split them in half right where the straight and curve meet. 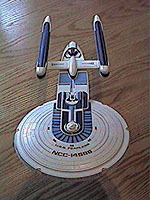 I marked my Excelsior- as the USS Fearless (NCC-14598). After-market decals were available at the time of writing for a number of ships from TDR Studios and Web Games. Both sheets are of excellent quality, with crisp, perfectly registered printing that snuggles down easily, without prompting from setting agents. 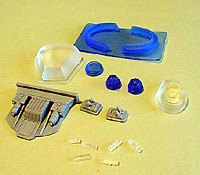 Don Matthys' Enterprise-B resin set. 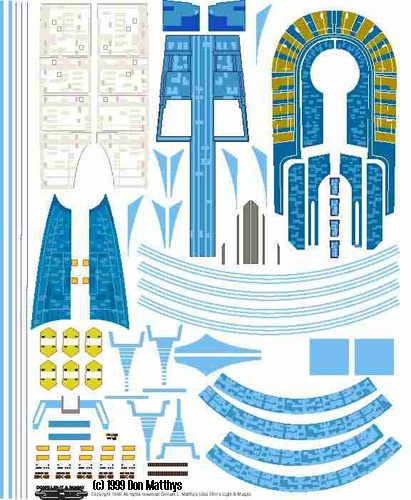 Don's Light & Magick makes resin detail sets and decals for both the Enterprise-B and Excelsior kits. The resin sets include blue tinted deflector dishes, bussard scoops and dekoids, clear rear "island", and improved photon torpedo launchers. The decals the various hull markings and patterns, but not ship registry numbers or names. TDR Studio's "Excelsior-Class Decal Sheet" (#TDR 1.0) includes the Berlin, Cairo, Charleston, Crazy Horse, Repulse, Potemkin, Fearless, Gorkon, Hood, Intrepid, Roylance and Melbourne. Web Games produced a decal sheet (#0003DC) for this kit which includes the Berlin, Cairo, Charleston, Crazy Horse, Enterprise-B, Fearless, Gorkon, Hood, Intrepid, Melbourne, Nazarek, Potemkin, and Repulse. Both sheets are now out of production, but many others have come available since this article was first written. Check with merchants listed in our Where to Buy Stuff listings for current products. Star Trek names, characters and all related indicia are the property of Paramount Pictures. All rights reserved. This page made possible by Starship Modeler - copyright © 1997. First posted on 10 November 1997. Last updated on 25 December 2004.